Hello again, fellow members. I know everyone will be looking forward to heading to the beach soon. By all accounts the weather is supposed to be fantastic over Christmas. Those of you who have been down to the club recently would have seen the renovated lifeguard kitchen and lounge, new storage areas and bunkrooms. I am sure you will all agree these are a huge improvement to the club’s facilities. I would like to thank Chris Amess and his team from Total Works Carpentry for working to a tight deadline and finishing on time. 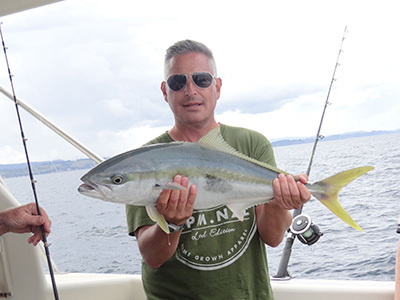 We also need to acknowledge the support of our principal sponsor, Trust Waikato and also the Hauraki District Council for providing major grants to get this work underway. You will also have seen a call for fundraising to provide new furniture for the club. In a short time we have received some very generous donations from club members and the local business communities in Whangamata. Waihi and Whiritoa. It is great to see your support for the club and as a committee we are working hard to make your club part of the community and a first class lifeguard service for you all. The Club is short of volunteers to run the bar over the summer season. If anyone can assist and go on the roster please contact Gavin Macdonald on gavmac@xtra.co.nz or 027 4973366. We don’t want to run dry over summer! Meet on the beach by the walkway nearest to the Surf Club. Open to all ages, individuals, groups and families. Use innovation and skill to impress the judges. Use only natural materials. Gold coin donation please. Kids, Nippers come and dig for prizes. Hands only. Meet at walkway left of Surf Club. Gold coin donation please. Kids, enjoy some messy fun. Please register at the shop for this popular event by 6pm on Saturday 27th. Held outside the Surf Club. Gold coin donation please. At the Surf Club. Teams of 5 for ages 10-14 only. Test your knowledge of music, sports, geography and pop culture and enjoy a fun evening. $10 per team. Form your own team or come along to join another. Restore energy back into your body after the Xmas feasts. These restorative yoga classes are aimed at opening up the energy channels in the body- suitable for all ages and abilities, and those who just want to get outside and do a little stretching in a peaceful environment. Just bring your own yoga mat (or towel), and comfortable clothing. Join Sarah on the sand at the lagoon. Gold coin donation please. Open to all ages, doubles only. If interested sign up at shop by noon on 28 Dec. Draw will be posted at Surf Club, shop and court. Saving day will be Wednesday if wet. Spiral, featuring the versatile and talented Andrew Hall, accomplished saxophonist and jazz singer, returns for another entertaining concert at the Surf Club. An accomplished band playing popular jazz and some of their own original music. A cold drink , great company, wonderful views and some relaxing music at the best garden bar in NZ. What more could you want? Dig deep for donations please. A popular and hotly contested event. Form a team with friends, family or neighbours to compete. A great way to meet your neighbours or other people in your street. Teams of 7, minimum of 3 females. Two age group competitions – Adults and kids (under 14 years of age at 30/12/2015). Entry per team $10 Adults and $5 kids. Quench your thirst in the bar afterwards. Do your body and mind a favour this morning: relax, rejuvenate, and strengthen. These restorative yoga classes are aimed at opening up the energy channels in the body- suitable for all ages and abilities, and those who just want to get outside and do a little stretching in a peaceful environment. Just bring your own yoga mat (or towel), and comfortable clothing. Join Sarah on the sand at the lagoon. Gold coin donation please. No evening events planned for New Year’s Eve. Mums and Dads, send the kids along while you enjoy some quiet time while you recover from last night’s partying. Hey kids! Get creative. A quiet, indoor activity doing beachy arts and crafts at the Surf Club for children aged 7-12 years. A maximum of 20 so first in, first served. Please bring $2 towards cost of materials. Form a team or join a team of 6 to put your brains to the test. At the Surf Club. An evening of light-hearted entertainment and competition. Entry charge of $5 per person Prizes. Bar will be open for refreshments. This is always very popular so be early or you will miss out. A long standing Whiritoa tradition. Registration forms available at shop and Surf Club from 31 Dec. Sign up at 8am, ready for an 8.30 am start. Kids- up to 15, Men, Women. Cups and prizes to be won. Entry charge $5 an adult, $2 per child. A fundraiser for a fantastic cause- our Surf Club. A session aimed at energizing your body for the New Year. Join Sarah on the main beach in front of surf club to welcome in the morning sun. Yes, an early start this time, but a great opportunity to experience the magic of sunrise yoga –you won’t regret it! Just bring your own yoga mat (or towel), and comfortable clothing. Gold coin donation please. Come and bag some bargains, try your luck on the raffles, scoff a sausage, sample some fresh produce or buy some beautiful crafts. We have it all! Events may have to be cancelled at short notice if weather is unfavourable. Please check notice boards for further details and any changes to the programme. Events are organised and run by volunteers for your enjoyment- Please support them. We are always looking for new ideas for events, willing helpers to run them and sponsors. If you can help please contact Wendy Turner-Wright. New detailed event calendar system implemented on the website. The club communications team (Alex Polglase and Blair Graham) have been working on a new calendar of events system to better communicate the long list of events we run throughout the year. 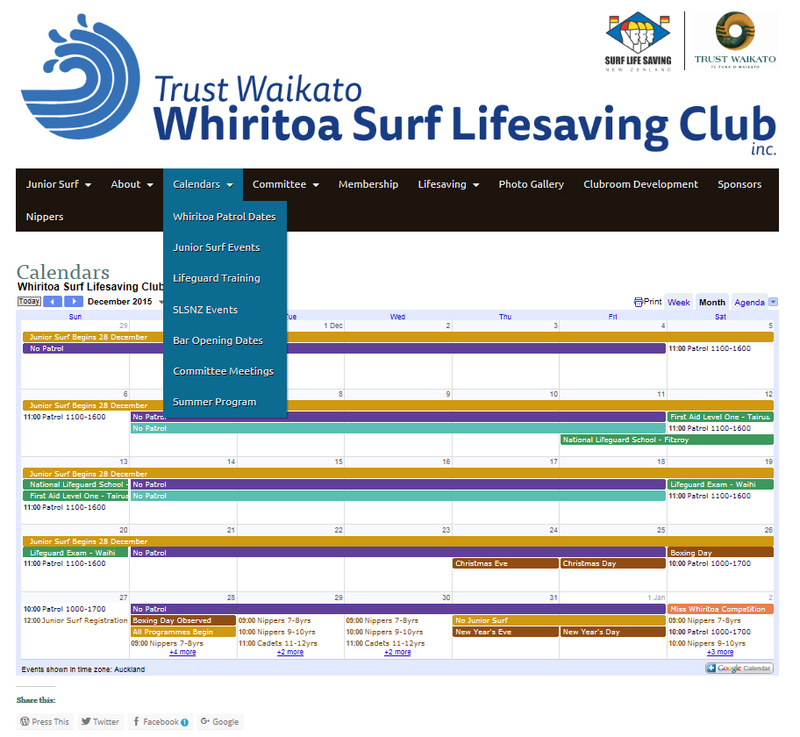 This can be found by clicking the “Calendars” link in the main navigation of the Club Website, http://www.whiritoaslss.com. Clicking the Calendars link brings back all events loaded and hovering over the link produces a drop down where you can select a category of event and it only brings back those events relating to that category. Hover over an event within the calendar and it brings back further detail like location, timings and comments. If you have an event you would like listed you can email this to whiritoaslssevents@gmail.com, and we will enter it for you. If your event doesn’t fit the above mentioned categories, send it anyway and we will setup an appropriate category. We could have a general district events category to post a fund raising event for the local Fire Service for example. We are really keen to make this the “goto place” for all events in the Whiritoa Village and surrounding areas. If you have some news, a funny story or just some general information and would like to include it in Toaline please send unformatted text and JPG images (images separate as attachments please) to blair@blare.co.nz. ← Want to be a barman?